In many countries in Latin America, crime and poverty as well as social inequality are serious social problems. Children raised in these environments are often dragged into the world of crime, delinquency, and violence. The governments of these countries are promoting free music education activities, with public and private institutions forming orchestras and bands in various regions in order to educate young people. 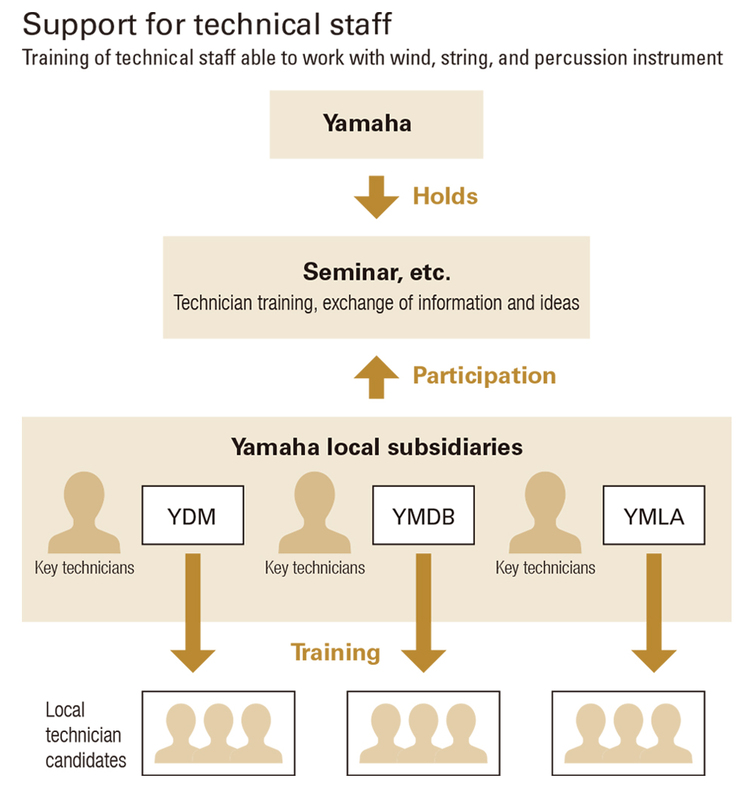 Yamaha approves of these efforts, and is engaged in its own unique support activities. It is estimated that the number of students participating in youth development orchestra and band activities is around 900,000*1, with that figure rising each year. These activities require a large number of musical instruments for the various organizations. As a result, there has been an influx of musical instruments from manufacturers around the world, and the musical instrument markets in these regions have experienced rapid growth. However, many of these instruments have not been properly maintained due to a lack of proper care, knowledge, and customs regarding daily instrument maintenance. The situation is worsening as there are no technicians in these regions to fix instruments when they break. In some instances the activities themselves have come to a halt because of the dwindling number of usable instruments. 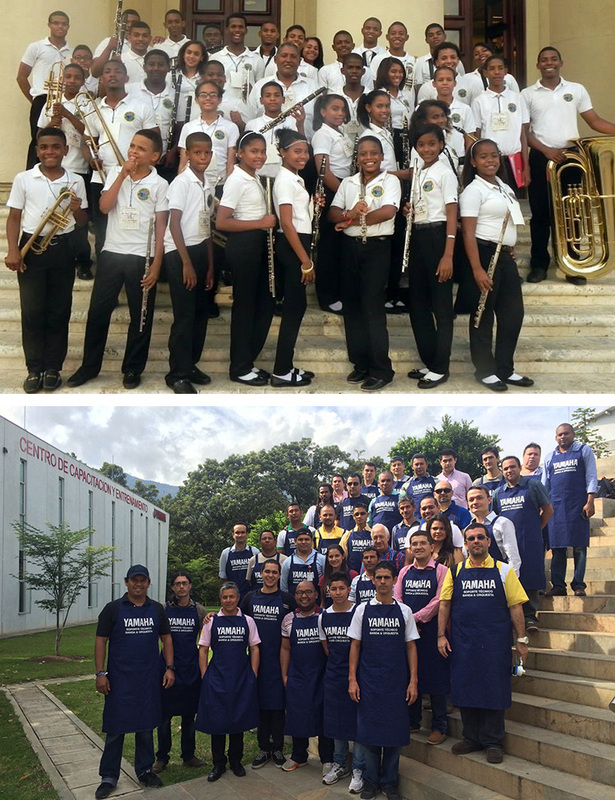 In response to this issue, local subsidiaries of Yamaha headquartered in Latin America have taken efforts over many years to support youth development orchestra and band activities, contribute to these regions, and foster an environment in which children can continue to play music. Beginning in 2014, the Yamaha Group has used the AMIGO Project*2 to strengthen support for youth development orchestras and bands. Daily maintenance is needed in order to keep a musical instrument in good condition over many years. Even when an instrument breaks, if a repair technician is nearby, they can fix it so it can continue to be played. 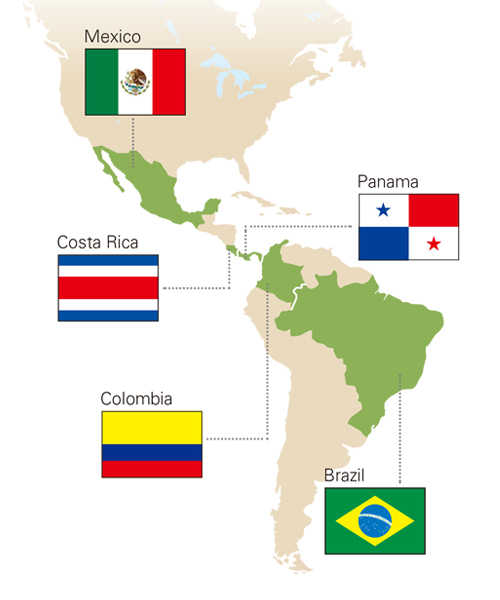 In the AMIGO Project, Yamaha holds maintenance workshops and repair technician training seminars in five Latin American countries. Through these activities Yamaha　contributes to the construction of local infrastructure. 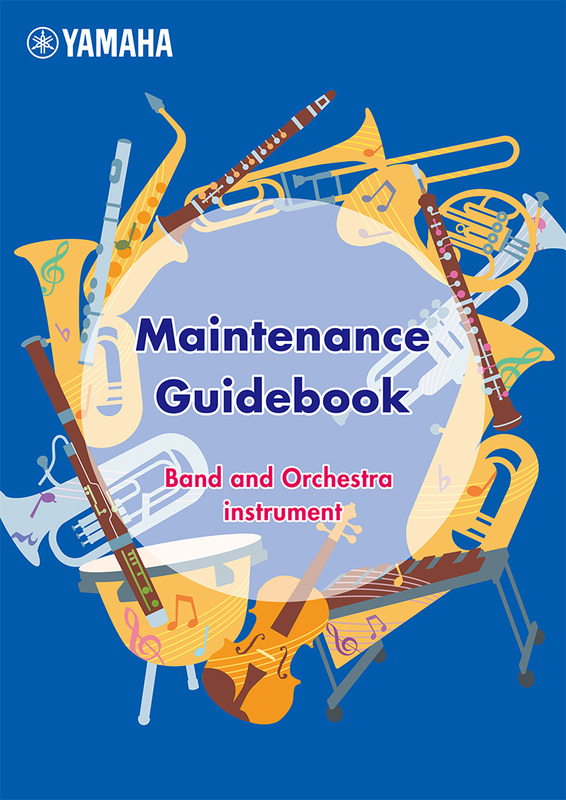 In the maintenance workshops, staff from local subsidiaries or dealers use maintenance guidebooks created by Yamaha to teach local instructors maintenance methods. After the workshop, these instructors teach the children the methods they learned. 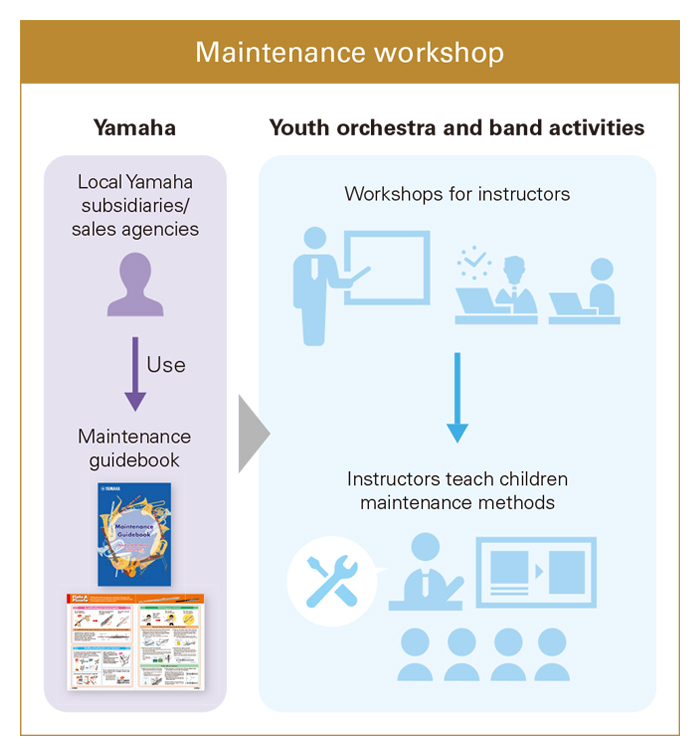 Having instructors teach these methods lets Yamaha pass on this instrument maintenance know-how to many children efficiently in a single session. For children, learning proper maintenance extends the life-span of their musical instruments and fosters a mindset of treating these instruments with care. In training repair technicians, Yamaha aims to educate the people who will become “key” technicians in each country, with local subsidiaries and dealers gathering together selected repair technicians, and hold seminars to teach repair know-how and techniques. These key technicians use the manuals explaining the knowledge, techniques, and repair methods they have learned to train other local technician candidates in their countries. 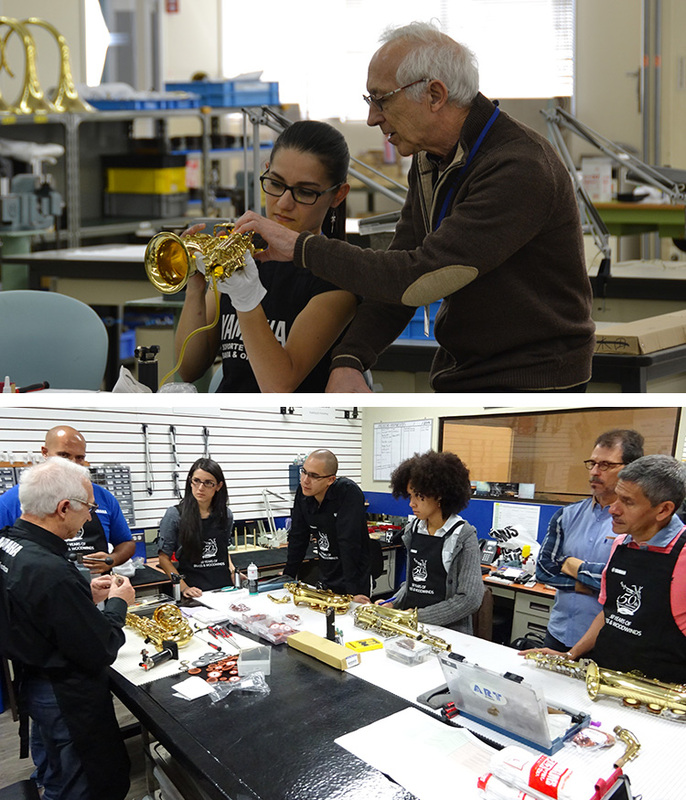 Yamaha believes that spreading and establishing knowledge and techniques related to instrument maintenance and repair is crucial to further developments in musical education and culture. Furthermore, Yamaha is also proactively engaged in new approaches, such as the development of easy-to-maintain, hard-to-break instruments which would provide a solution to the root problem. Música para la Vida is an organization which was established in 2013 in San Luis Potosí, a medium-sized city in central Mexico, in order to promote social reforms through music. This organization now comprises four orchestras, two wind orchestras and two chorus groups. A total of 76 instructors lead around 1,500 children (as of August 2018). This organization does not rely solely on government subsidies, but ensures its sustainability by securing private financial sources for its funding. San Luis Potosí has the largest population of any city in its state. However, it is not a wealthy city, as around 45.5% of its population is below the poverty line (as of 2016). While many children are in a disadvantageous educational environment, Música para la Vida promotes their healthy development by forming a music community that helps to strengthen societal bonds. This organization is making efforts to give back to society by through initiatives to develop culture and education, create jobs, and improve public safety in the region. Yamaha de México (YDM) began supporting Música para la Vida in 2014. YDM has supported an environment in which children can happily enjoy music through technical support, which includes maintenance workshops and technician training seminars, as well as providing various information related to musical instruments. When Música para la Vida experienced the theft of its equipment, YDM provided maintenance kits free of cost. 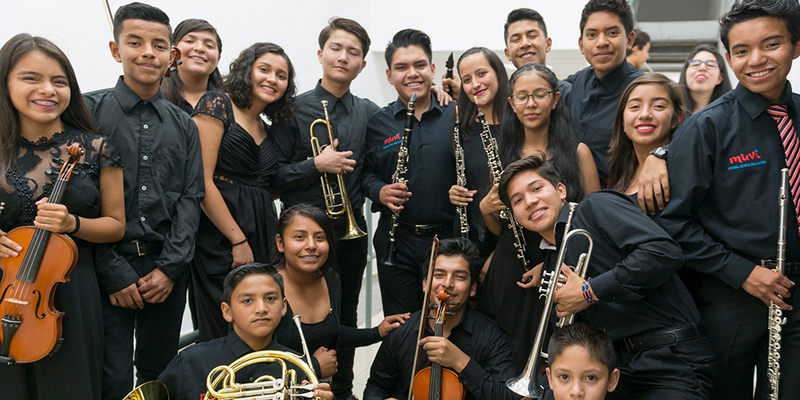 In the future, YDM plans to continue to support the smooth operation of Música para la Vida and its music education activities for youth development, using the know-how and services that YDM has developed over many years. The children have grown a lot through these band and orchestra activities. As their music playing skills improved, they were able to feel more self-confident, and furthermore, by finding their place in this organization, many felt more assured of their self-worth. By developing communication skills, they were able to improve their interpersonal relationships, and we also saw an increase in their motivation toward their studies at school. Seeing these changes in the children up close, I was once again made aware how music education can drive societal change. We hope to further strengthen and develop our music education activities in order to establish an environment in which children can enjoy music as they live comfortably and securely. In doing so, we hope to contribute to society. Up until now, I have wasted a lot of time on an unnecessarily complex method of repairing instruments. However, after attending Yamaha’s repair technique seminar, I have learned how to perform even difficult repairs smoothly and with a high degree of quality by using proper tools and the best methods. I hope to teach everything I have learned from Yamaha to other people so that they too can easily understand how to solve problems with instruments. I hope to utilize this knowledge and information to one day have my own repair workshop in Música para la Vida.